David Sarnoff (February 27, 1891 – December 12, 1971) led the Radio Corporation of America (RCA) in various capacities shortly after its founding in 1919 to his retirement in 1970. Known as "the general," he ruled over an ever-growing radio and electronics empire that became one of the largest companies in the world, branching into the world of television through supporting the development of the electronic television and the formation of the NBC network. Sarnoff's astounding vision shaped American mass media—from putting a radio in every home, to advancing the technology that brought television to everyone. As humankind enters a new era of globalization and the desire for a peaceful world, communication is of the essence. Sarnoff's contribution laid the foundation for the external aspects; the internal, however, depend not on physical electronics but on changing human nature. Sarnoff was the eldest son of Abraham and Leah Sarnoff. He was born in Uzliany shtetl near Minsk, Russia (now in Belarus) to a poor Jewish family. Given the limited opportunities for Jews in Russia, Sarnoff's future as a bright young boy seemed assured as a rabbi. Until his father immigrated to the United States and raised funds to bring the family, Sarnoff much of his early childhood in a kheder studying and memorizing the Torah. He emigrated with his mother and two brothers to New York City in 1900, where he supported his family by selling penny newspapers before and after schooling at the Educational Alliance. When his father became incapacitated by tuberculosis in 1906, Sarnoff planned to pursue a full-time career in the newspaper business. A chance encounter led to a position as an office boy at the Commercial Cable Company. When his superior refused him unpaid leave for Rosh Hashanah, he joined the Marconi Wireless Telegraph Company of America on Sunday, September 30, beginning a career of over sixty years in electronic communications. Sarnoff married Lizette Hermant on July 4, 1917. Despite some indiscretions on Sarnoff's part, the marriage was successful and the couple had three sons: Robert, Edward, and Thomas. He groomed his eldest son, Robert, to follow in his footsteps as the president of RCA following his retirement. During World War II, Sarnoff served on Eisenhower's propaganda staff, arranging expanded radio circuits for NBC to transmit news from the invasion of France in June 1944. In France, Sarnoff arranged for the restoration of the Radio France station in Paris that the Germans had destroyed, and oversaw the construction of a radio transmitter powerful enough to reach all of the allied forces in Europe. He received the brigadier general's star in December, and thereafter preferred to be known as "General Sarnoff." In 1955, Sarnoff received The Hundred Year Association of New York's Gold Medal Award "in recognition of outstanding contributions to the City of New York." Sarnoff retired in 1970 at the age of 79, and died at one year later at age 80 of heart failure related to shingles. He is interred in a mausoleum featuring a stained-glass vacuum tube in Kensico Cemetery in Valhalla, New York. Sarnoff was inducted into the Radio Hall of Fame in 1989. Sarnoff rose from office boy to commercial manager of the RCA company, learning about the technology and business of electronic communications on the job and in various libraries. He served at Marconi stations on ships and posts on Siasconset, Nantucket and the New York Wanamaker Department Store. In 1911 he installed and operated wireless equipment on a ship hunting seals off Newfoundland and Labrador, and used the technology to relay the first remote medical diagnosis from the ship's doctor to a radio operator at Belle Isle with an infected tooth. The following year he led two other operators at the Wanamaker station in an effort to confirm the fate of the Titanic and gather the survivors' names. Sarnoff was not the first to hear the news, but he and others did man the Marconi wireless station (telegraph) atop the Wanamaker Department Store in New York City, and for three days relayed news of the disaster and names of survivors to people waiting outside. Over the next two years, Sarnoff earned promotions to chief inspector and contracts manager. The company's revenues swelled after Congress passed legislation mandating round the clock staffing of commercial shipboard radio stations and Marconi won a patent suit that gave it the coastal stations of the United Wireless Telegraph Company. Sarnoff demonstrated the first use of radio on a railroad line, the Lackawanna Railroad Company's link between Binghamton, New York, and Scranton, Pennsylvania; permitted and observed Edwin Armstrong's demonstration of his regenerative receiver at the Marconi station at Belmar, New Jersey; and used H. J. Round's hydrogen arc transmitter to demonstrate the broadcast of music from the New York Wanamaker station. This demonstration and the AT&T demonstrations in 1915 of long-distance wireless telephony inspired the first several of many memos to his superiors on applications of current and future radio technologies. Sometime late in 1915 or in 1916 he proposed to the company's president, Edward J. Nally, that the company develop a "radio music box" for the "amateur" market of radio enthusiasts. Nally deferred on the proposal because of the expanded volume of business during World War I, and Sarnoff devoted his time to managing the company's factory in Roselle Park, New Jersey. When Owen D. Young of the General Electric Company arranged the purchase of American Marconi and turned it into the Radio Corporation of America (RCA), a radio patent monopoly in 1919-1920, Sarnoff revived his proposal in a lengthy memo on the company's business and prospects. Again, his superiors ignored him, but he contributed to the rising postwar radio boom by helping arrange for the broadcast of a heavyweight boxing match between Jack Dempsey and Georges Carpentier in July 1921. Up to 300,000 people heard the fight, and demand for home radio equipment bloomed that winter. By the spring of 1922 Sarnoff's prediction of popular demand for broadcasting had come true, and over the next eighteen months he gained in stature and influence. Sarnoff was named general manager of RCA, a publicly held company owned by General Electric which had a controlling interest in the company, under GE chairman Owen D. Young. When he was put in charge of radio broadcasting at RCA, Sarnoff soon recognized the potential of television. He was determined for his company to pioneer the medium. He met with Westinghouse engineer Vladimir Zworykin in 1928, who was developing an all-electronic television system in his spare time on the company premises. Zworykin told Sarnoff he could build a viable television system in two years with a mere $100,000 grant. Sarnoff decided to fund his research but the estimate was off by several orders of magnitude and several years. RCA finally demonstrated a working "iconoscope" camera tube and "kinescope" receiver tube to the press on April 24, 1936. The final cost of the enterprise was closer to $50 million. On the way, they had to battle young inventor Philo T. Farnsworth who managed to secure patents in 1930 for his solution to broadcasting moving pictures. In 1929, Sarnoff engineered the purchase of the Victor Talking Machine Company, the nation's largest manufacturer of records and phonographs, merging radio-phonograph production at Victor's large manufacturing facility in Camden, New Jersey. Sarnoff became president of RCA on January 3, 1930, succeeding James Harbord. On May 30 the company was involved in an antitrust case concerning the original radio patent pool. Sarnoff was able to negotiate an outcome where RCA was no longer partly owned by Westinghouse and General Electric, giving him final say in the company's affairs. Initially, the Great Depression caused RCA to cut costs, but Zworykin's project was protected. After nine years of hard work, Sarnoff's determination and Zworykin's genius, they had a commercial system ready to launch. The standard approved by the National Television Systems Committee (NTSC) in 1941 differed from RCA's, but RCA quickly became the market leader. After the war, monochrome television production began in earnest. Color television was the next major development and CBS had their electro-mechanical color television system approved by the FCC on October 10, 1950. Sarnoff filed an unsuccessful suit in the United States district court to suspend the ruling. He made an appeal to the Supreme court which also upheld the FCC decision. Sarnoff pushed his engineers to perfect an all-electronic color television system that used a signal that could be received on existing monochrome sets. CBS was unable to take advantage of the color market due to lack of manufacturing capability and sets that were triple the cost of monochrome sets. A few days after CBS had its color premiere on June 14, 1951, RCA demonstrated a fully functional all-electronic color television system. Sarnoff was also involved in the strategic RCA-NBC partnership. Sarnoff notoriously stole ideas from competitors and used the legal capabilities of his giant corporation to protect his maneuvers in court. Under Sarnoff's guidance, NBC introduced the first all electronic television at the New York World's Fair in 1939. Sarnoff also negotiated the great coup of getting Franklin Delano Roosevelt to appear on NBC, making him the first president to appear on television. Sarnoff also pioneered the televising of live sports events and other notable occurrences such as the visit of the king and queen of England to the World's Fair. 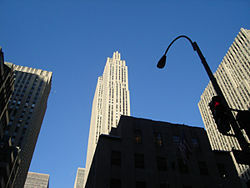 Sarnoff's vision led to NBC acquiring a number of radio stations and developing itself as a network, ultimately leading to the division of the Red and Blue networks. Sarnoff represents the classic "rags to riches" tale of American lore. His rise from Eastern European poverty to the presidency of a major network is an inspiration to anyone from a less-than-privileged background. Sarnoff's drive and vision helped shape American broadcasting. His determination to see a radio in every household in America was largely successful thanks to his leadership in programming and business at RCA. While this drive profited him greatly, America and the world are better off for the advent and proliferation of radio technology. It paved the way for other technologies such as television (which Sarnoff was also instrumental in popularizing), and later the internet. Sarnoff's drive prepared the American public for mass media. These technologies are important as they have created a common culture in the United States completely unknown before the twentieth century. Sarnoff's obituary ran nearly one full page in The New York Times and aptly summed up his career in these words: "He was not an inventor, nor was he a scientist. But he was a man of astounding vision who was able to see with remarkable clarity the possibilities of harnessing the electron." ↑ Michael O'Toole, “David Sarnoff,” Business Biography, University of St. Francis. Retrieved August 3, 2007. ↑ 2.0 2.1 David Sarnoff, Museum of Broadcast Communications. Retrieved August 3, 2007. ↑ David Sarnoff, Radio Hall of Fame. Retrieved August 3, 2007. ↑ “The American Experience: More About Sarnoff, Part One,” Public Broadcasting Service (PBS). Retrieved February 22, 2007. ↑ Past Leaders: Owen D. Young, General Electric. Retrieved August 3, 2007. ↑ Evan Schwartz, 2003, The Last Lone Inventor: A Tale of Genius, Deceit, and the Birth of Television (Harper Paperbacks, ISBN 0060935596). Dreher, Carl. 1977. Sarnoff: An American Success. New York: Quadrangle/New York Times Book Company. Lyons, Eugene. 1966. David Sarnoff: A Biography. New York: Harper & Row. 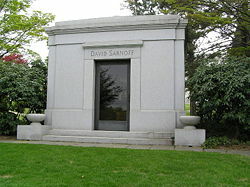 Sarnoff, David. 1968. Looking Ahead: The Papers of David Sarnoff. New York: McGraw Hill. This page was last modified on 10 November 2017, at 22:39.